The SuiteSports team is proud to welcome a true sports legend, Bob Lobel. For those of you young whippersnappers that don't know who Bob is, just know that you're ripping him off every time you say a team is pushing the "panic button." Find out more about our new blogger below. Bob Lobel is a legendary New England Sports Broadcaster known for his unique style and catch phrases including "Why can't we get players like that?" and the "Panic Button". He is the former sportscaster for WBZ-TV and hosted the weekly programs Sports Final and Patriots 5th Quarter. 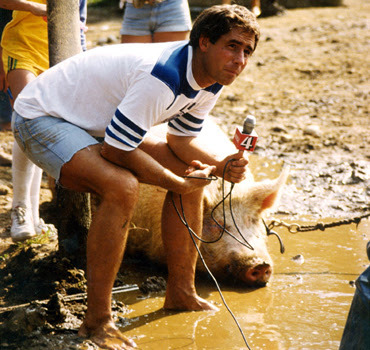 Before joining the television side of WBZ, Lobel worked at WBZ radio as the co-host with Upton Bell of Calling All Sports. Along with writing his blog for SuiteSports, Bob can be seen weekly on Sports Legends New England on WBIN-TV Boston and WPME Portland ME. He can be heard weekdays on WTPL Radio, and is currently serving as a PA announcer at Fenway Park for weekend Boston Red Sox games. Throughout his career Bob was named Sportscaster of the year on numerous occasions. Bob is also known for his local charity work for Children's Hospital and The Genesis Fund, among many others. So yeah, he's kind of a big deal.